Today is Veterans Day in the United States…make sure you let any veterans you may know how much you appreciate the sacrifice they have made to keep this great country of ours free. It is because of them you and I can enjoy the liberties and freedom we enjoy every day of our lives. This is also Nigel Tufnel Day (The Nigel Tufnel Day Appreciation Society and Quilting Bee in Favor of Declaring & Observing November 11, 2011 as Nigel Tufnel Day (in Recognition of Its Maximum Elevenness), legendary guitarist from Spinal Tap. If you haven’t seen This Is Spinal Tap…do so. It is one of the funniest movies you will ever see…you have my word on that. Unfortunately, I am quite under the weather today. Lots of congestion and just feeling plain yucky. 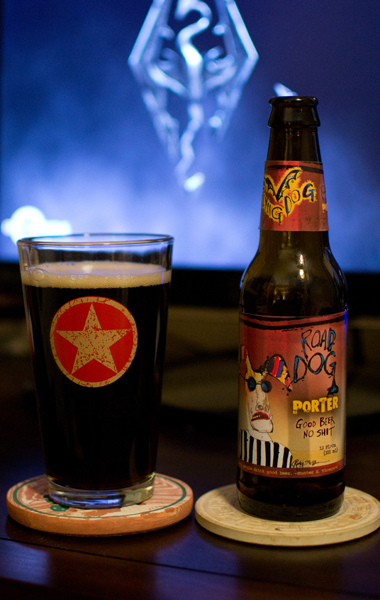 So I will not review beer #348, Road Dog Porter by Flying Dog Brewery, since I can’t smell or taste much of anything. In the spirit of the 365, I will drink it though. Here is to hoping I feel better tomorrow. 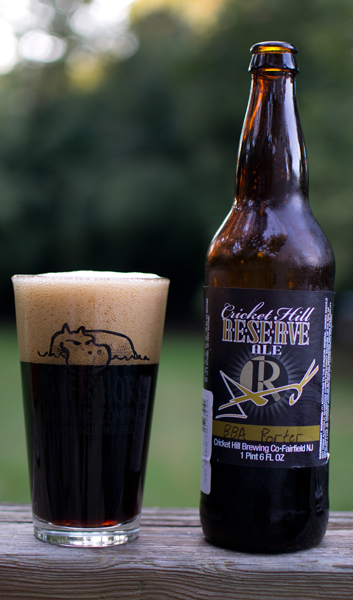 Beer #314 is Reserve Ale BBA Porter by Cricket Hill Brewing Company from Fairfield, New Jersey. They brew this American Porter with an ABV of 6.7%. The BBA in the name stands for bourbon barrel aged and the Reserve means that these are special beers Cricket Hill brews. They only brew 4 Reserve Ales a year. I have another lined up for tomorrow, an American Brown Ale. This beer poured a dark brown, it could have been black. The head was light brown and quite large and very fizzy. The nose was very woodsy with loads of vanilla. Did I mention this was aged in bourbon barrels? Well it was and it smelled like bourbon/scotch/whiskey. Take your pick for they all kind of smell similar to me but then again…I’m not a connoisseur of those types of alcohol. It tasted exactly like it smelled with the inclusion of a bit of chocolate. It had a very slight burnt ending to it. It was a bit thin body wise for my liking for an American Porter and was quite harsh mouthfeel wise with a nice amount of stinging carbonation. Even know it smelled quite like the alcohol bomb…that was not really the case. For me…this didn’t work as an American Porter. I just didn’t dig this at all. It was more like a bourbon flavored beer. I like a coffee flavor in my porters but this had none of it and it was just a bit too thin. Lets hope tomorrows from Cricket Hill is better. I’m not into this tonight (blogging…not beer), just a word of warning. 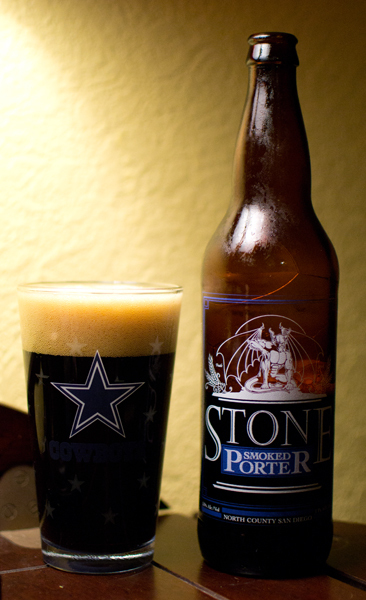 Beer #303 is Smoked Stone Porter by Stone Brewing Company from Escondido, California. This American Porter has an ABV of 5.9%. It was black and had a very nice tan head. Nose was kind of light with chocolate, coffee, & roasted caramel malts. Taste was better than the nose, slightly sweet and a bit of a bitter dark chocolate flavor. It had a decent roasted coffee flavor and was a bit smoky near the back end. It had a medium body with just a bit too much carbonation. This was a decent American Porter but not even close, IMHO, to Robust Porter by Smuttynose or Red Brick Porter by Red Brick. I was out of beer, so to the local beer store I went. I picked up beer #283 just by what it said on the label…brewed with 2 varieties of hops and 5 types of malts. It also mentioned in very small letters…ale in tx. Wonder what that means? I also picked up a bag of habanero kettle chips. Sounds good to me! 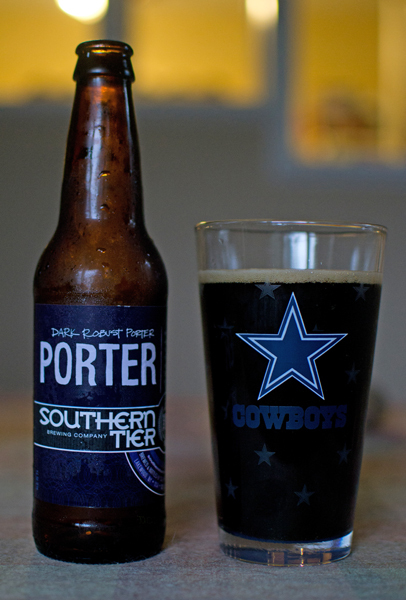 The beer I picked up is Porter by Southern Tier Brewing Company from Lakewood, New York. Their version of an American Porter has an ABV of 5.2%. Lets get drinking! It had a very dark brown color…for all I know it could have been black. There was only the tiniest of heads in the form of a tan ring. The nose was disappointing, it really didn’t have much of an aroma at all. There was a very faint chocolate smell…and that was about it. The taste was a bit better with a roasted malt flavor and a bit of semi-sweet chocolate. It had a slight hoppy herbal thing going on at the very end There was no aftertaste whatsoever. It had a light but not quite watery body, very low carbonation, and was quite creamy and smooth. It went down really easy. I was disappointed. I was expecting so much more from this, mostly in the way of a nice coffee like flavor which it did not have. I would also have liked a bit of a bitter bite…oh well…I can dream. That being said it wasn’t horrible…just maybe a tad bit below average. The best American Porter I have had, and this didn’t come close, was Robust Porter by Smuttynose Brewing Company, drink that instead of this. Oh yeah…the habanero chips were excellent…nice and hot! Beer #138 is Robust Porter by Smuttynose Brewing Company. From the Live Free or Die State of New Hampshire comes this American Porter. The ABV of this brew is a nice 5.7%. Look at that nice really deep dark brown color topped by a thin tan head. Roasted aromas abound in the nose. Coffee and chocolate…yum! I knew I was going to like this just from the nose alone. What you smell here is what you get in the taste. It starts off with deep dark roasted coffee goodness, followed by something slightly sweet (caramel? ), and ends with a nice bitter (must be the hops) chocolate ending. Mouthfeel was nice and creamy bordering on being thick…but in a good way. It had a decent amount of carbonation. Highly drinkable…more so as it warms up to room temperature. I wanted more of this but I only had the one…darn. Maybe a quick trip to the liquor store after will be in order. Rain…that is the story of the day so far. I can’t think of a better way to spend a rainy day then to sit on the screened in porch & wait for the clouds and rain to go the way of the Dodo bird. 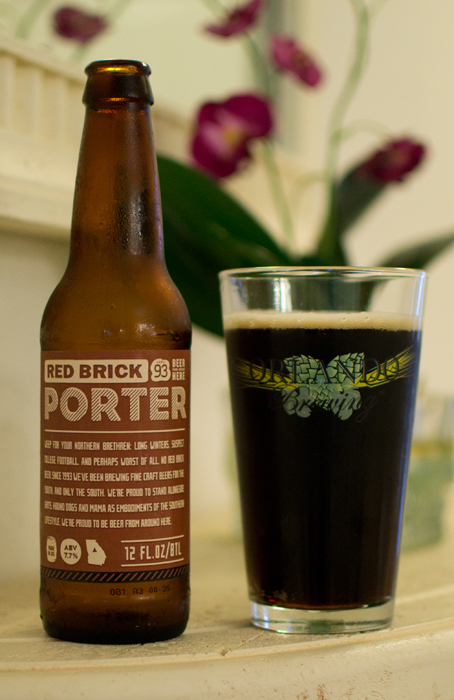 Beer #128 is Red Brick Porter by Red Brick Brewing Company from Atlanta, Georgia. This American Porter has an ABV of 7.7%. The color of this brew was a dark brown and it had a minimal tan head. Excellent lacing did that tan head leave behind in the Orlando Brewing pint glass. This had aromas of chocolate and roasted coffee, both which were reflected in the taste. It has a nice medium body with quite a bit of fine carbonation that danced around on my tongue. For 7.7% ABV, I thought the alcohol content was hidden really well and overall this was an easy drinking beer. This was pretty yummy…if you like coffee…there just isn’t any way you couldn’t enjoy this. Give me some of that good stuff…good stuff you Shiny Happy People! (B52’s and R.E.M. references there for all you Cosmic Things out there). A beautiful, albeit windy, day here in NJ as winter is in its final 15 days. Today was a day for yard work, chainsawing blown down limbs, raking up branches and leaves, and generally getting the yard in shape after the long winter. Yard work makes me thirsty for beer and considering this is a beer blog…lets grab a cold one! 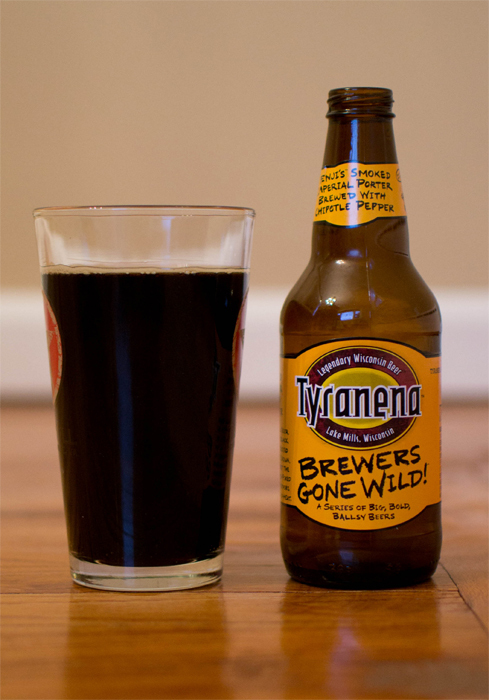 Beer #97 comes from Wisconsin and the Tyranena Brewing Company. Let me introduce to you Benji’s Smoked Chipotle Imperial Porter, an American Porter with an ABV of 7.5%. This is part of Tyranenas Brewers Gone Wild series of beers, a series of big, bold, ballsy beers. Brewed with chipotle peppers, that’s correct, you read that right, chipotle peppers. I love peppers of any kind, the spicier the better and I like my porters so lets see how this works out. Black was the brew with no head whatsoever. The nose was of dark roasted malts, chocolate, a bit of vanilla, and the smoky spiciness of the pepper. The smokiness hit me first in the taste followed by the chocolate and finishing up with more of that smoky spiciness of the pepper. The mouthfeel is silky smooth, almost oily in the way it coats the mouth and tongue. An easy beer to drink as nothing is overpowering. The chipotle works well here lending a nice spiciness and smokiness to this porter. This is another excellent beer. One I could easily have had more of but alas, one is all I had.